Location: Autoire, in the Meurthe-et-Moselle departement of France (Lorraine Region). Notes: The castle of the English is located in the commune of Autoire, in the department of Lot.In the ancient texts, the castle is referred to as La Rocca. In 1178, the châtellenie of Saint-Céré on which Autoire depends, passes into the possessions of the viscounts of Turenne. Autoire is on the border between the counties of Auvergne and Toulouse. It is probably on this date that the castle begins to be built by the Baron de Castelnau-Gramat in the form of a shelter under fortified rock attached to the cliff. Garin de Castelnau, lord of Gramat, pays homage for his possessions, including the castle of Roque d'Autoire, to Alphonse de Poitiers, count of Toulouse, in 1259. In 1286, the castle is among the towns and seigniories ceded by the King of France to the King of England. The castle was occupied in 1378 by the road captain Bernard de La Salle in the pay of the King of England. The castle and the fortified village served as a haunt for the English companies during the Hundred Years War. Just after this war, the lord of Autoire built the tower with a spiral staircase and machicolations against the fortified dwelling. In 1562, Autoire was occupied by the Protestants. An act dated March 3, 1588 indicates that the castle was occupied by a Protestant band commanded by Jean Mollé known as Captain Vinsou who goes to the governor of Saint-Céré and the community of Autoire for the benefit of the viscount of Turenne. During the Fronde in 1647, the Vicomte de Turenne, one of the leaders of the Fronde, had the castle's defenses restored. Then the place is abandoned. In the eighteenth century the inhabitants began to plunder the stones of the castle, then it was absorbed by the underbrush and passed into oblivion. The castle was registered as a historic monument on 26 October 1925. 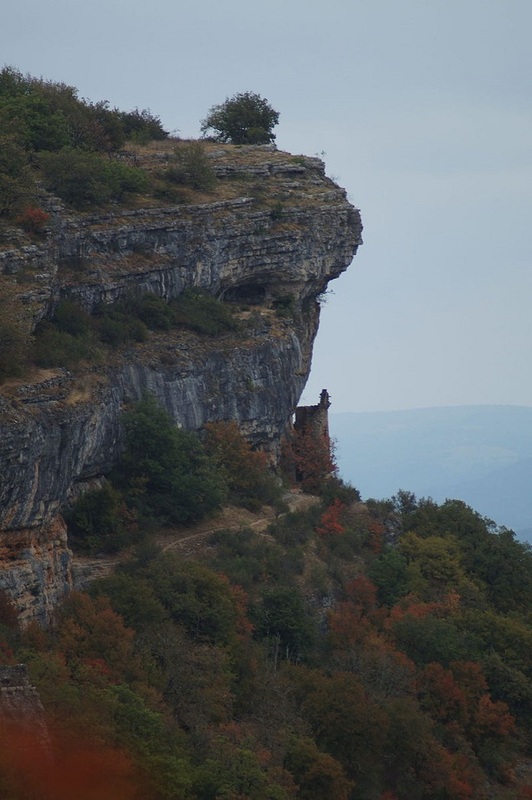 Around the cliff, numerous climbing routes have been equipped.It is a fortress backed by a cliff. The fortified complex had a front of about 200 m and 30 to 40 m of depth placed against the high cliff of 50 m. It was spread over three terraces in a staircase. He had four towers of which only the base remains. The north tower had a postern. A fortified cave from the twelfth century was part of the defensive ensemble. It is probable that there was to be a watchtower at the top of the cliff. The castle of the English, with an advanced tower, controlled the main access to the fortified complex, to the south-west.